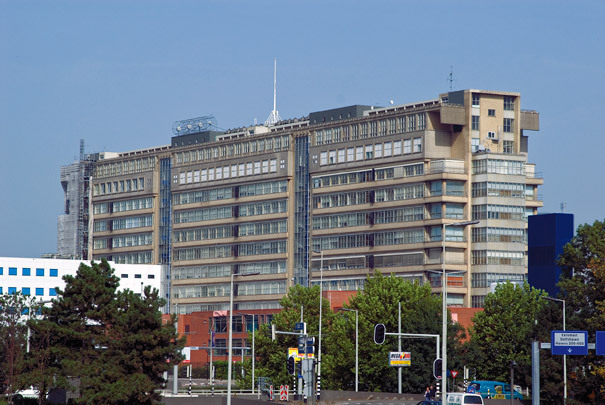 Built to replace its predecessor, Coolsingelziekenhuis, which had been destroyed during the war, Europe's most modern hospital was built at Land van Hoboken, giving it a central place in the city and good connections with South Rotterdam. The name Dijkzigt derives from the Hoboken family villa. Able to accommodate 1000 patients, the main building has a double corridor with wards along the two facades and rooms and services for the nursing staff in the central zone. Two low-rise wings set side on to it contain the out-patients' departments, rehabilitation department and education rooms. With the wings somewhat splayed, it was logical that the main entrance should fall between them on Wytemaweg. The building's disposition of functions is expressed in the facades which have an almost Eastern European look. The medical complex also includes the Medical Faculty and the Sophia Children's Hospital. Now seriously in need of replacement, Dijkzigt hospital will in time make way for new-build belonging to Erasmus MC, a university medical centre. A complex of 300,000 m2 is in the process of being constructed (until 2018) with parking facilities for 3000 cars and reached from Westzeedijk. The main entrance will be in the vicinity of the metro station. EGM Architecten masterplanned the complex whose various components are fleshed out by different architects.